After making a procedurally-generated pipe photography game for Wizard Jam 4, I'm back for more! I hope ya'll are ready to get hoisted, because LORD HOISTMAS is coming to town. In ancient times, man created a weapon known as the petard. This fearsome explosive was created to destroy walls and doors. But another spicy use was soon discovered: hoisting. 1000 years later, the immortal god-king LORD HOISTMAS rules over the humans. Hoisting has become a professional sport. 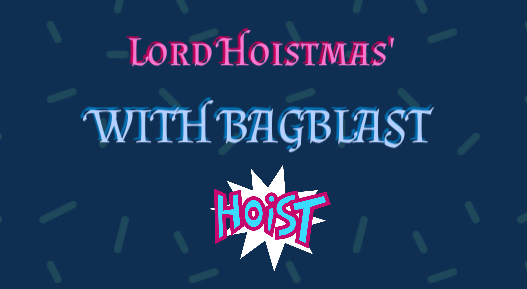 Every year, we hold the Bagblast tournament, and only the greatest hoister will have the honor of challenging our LORD in the final match. An explosive bocce-like dystopian pro sports sim with arcade hexagon elements. Hoisted: You can literally hoist yourself by your own petard. Limited Vocabulary: Your only verb is "throw". "You Just Played Yourself 🔑": Every round begins with your placement of the petard. While you are technically competing against an opponent, the real challenge is to throw your balls close to your original throw. A poor petard placement can make this task very difficult. Texture Thrift: Almost every texture in the game is re-used and re-colored at least once. Nice deep, rich lore! Nick will love it. Maybe you are trying to get as close to the petard as possible without hitting is, as that would set it off? Premature hoisting could actually be a valid strategy though. Something about a curveball is just so satisfying to watch. Anyways, controls are the next step. I'm thinking of some kind of timing minigame. Do you get to control the ball trajectory post throw? Like an influencer input kind of thing? Either way, this looks like it's turning into something fun! Didn't get much done during the week, but I should still be able to finish by Sunday. Anyways, here's the weird controls minigame I came up with. You aim the ball, and then hit space to start charging your shot. Hit space again to shoot the ball. If you time it right when the circle fills the yellow outline, the ball will land where you aimed. The twist is that there's Super Hexagon-style walls, and hitting a wall will add spin to the ball. The longer your shot, the more difficult it becomes to avoid the walls. But skilled hoisters will learn to exploit the walls to add precise amounts of curve to the ball. It definitely needs some transitions, sounds, and effects. And probably a tutorial, too. But I think the mechanic works well enough for the gameplay I have in mind. I'm gonna try to get the petard mechanic finished over this weekend, and implement an actual scoring system. Maybe I'll even get a simple AI opponent working. Once that programming stuff is done, I can spend the rest of the jam just messing around with art, levels, sounds, music, etc. Got a full gameplay loop! This gif shows only 1 toss per player, but I can set that to any number. 4 seems like a good match length. So, pretty much all the programming is finished. I even have a simple AI system so I can have some opponents that are more aggressive, more accurate, better at utilizing spin, etc. Gonna spend this weekend working on art, sound, and levels. Who knows how much I'll get done, but at least I've got something worth calling a "game" at this point! That's a neat-o idea and execution, looking forward to playing it! Made some progress on graphics. Pretty satisfied with the petard explosion effect. Not quite satisfied with the rest of it, but I've got more important stuff before I do another pass. Got a sort-of release version. Only 1 level, and no sound, but everything seems to work. Might see if I can finish up the rest of the levels tomorrow, and maybe throw in some sound effects. Showing the arcs of all your throws at the end is a neat addition. I'm curious as to how the opponent's AI works. Mine seemed to throw a little to the left every time. The AI is pretty simple. I start by calculating a "perfect" trajectory, then I reduce the power by 25% so the ball will land in front of the petard and roll into it. Next I add 0-5 degrees of randomness to the throwing angle. And then I simulate the "spin" phase by adding between 0 and 1 bars of left or right spin, and 0 to 2 bars of top or back spin. Top/back spin will usually result in a fairly close shot, but left/right spin will usually miss the petard significantly. Ah, cool. Must've just been chance or confirmation bias that made me think they always threw left. Just updated with 2 more levels. If I have time after work tomorrow, I might throw some sound effects and music into the game. But I consider the current version "95% final", so feel free to play it and give feedback!